Paperback available from your favourite online store or buy a signed copy here. eBook available from Smashwords or your favourite online store. For Garney, 'Coming into his Twelfth' will not come fast enough to prevent him from getting school grades of 'G's (utterly useless) and 'H's (very utterly useless) or being bullied by Thatch Huddersby and his gang. But all this is thrust aside as he arrives at the 4 ¼ dimensional House of Two Rooms, the shared inheritance of all who have Pepper Barnicoat as their multi-grandfather, a mansion where everything is exactly nothing like it seems. Here Garney discovers that he is a descendant of one of the five Druidic families of Yore. Curiosity brings accident and Garney and his crippled cousin Eldeth adventure and misadventure their way to the walled city of Yore in the 4 ½ th dimension, where children wear earmuffs while playing stick-ball because – BLAM! – that extra half a dimension sure smarts. twelve-year-old with the weight of a whole civilisation on his shoulders can do. This is a wild, rambunctious book, you will love. Garney lives a life ‘out of order’.He’s a dreamer and friendless, and is always late. He delights in being with his cousin and best friend Eldeth, who has also just turned twelve. Arriving at the House of Two Rooms, ‘the shared inheritance of all the Barnicoats with Pepper as their multi-grandfather’, Garney is allocated the room with the dragons on the door and the inside walls. He is also given a camouflaging Barni-coat. The symbolic meaning of this room and how it will inform his life is slowly revealed. with everything he longs to do. Garney dreams of a magic potion that will straighten Eldeth’s crooked back and legs. move into another dimension in more ways than one. In this dimension, Garney fits; he belongs. the warring of good and evil in different forms reshapes the two friends. creator. It is true that it will be read twice, for only in the second reading will the scope of the author’s imagination be acknowledged. 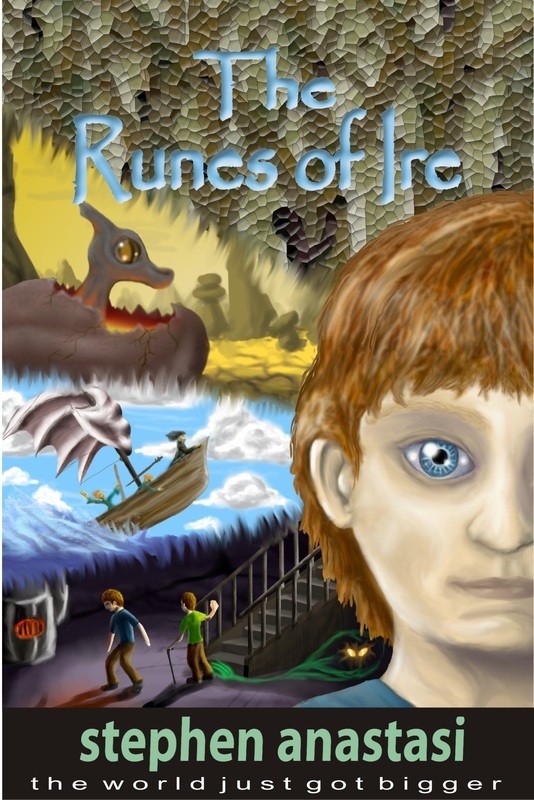 RUNES OF IRE - Reviewed by Angela Hall. Some of you may have been wondering where I have been lately. With nary a tweet or a status update. The explanation is a lot more complicated than it seems. I have been in Yore. into his twelfth he starts to embark on a Barnicoat right of passage. He moves into the family estate known as Two Rooms which is a house filled with magic and mystery. But only if you know how to look for it. It isn't long before Garney and his cousin Eldeth find themselves on an adventure from which they may not be able to return. Where dimensions are different, hidden realms become exposed and mythical creatures abound. other-side of the universe I too have fallen victim to the enchantment written by Stephen Anastasi, trapped inside an un-put-down-able book. Desperation edged his eyes as he ran to the window and looked down. A bus trundled along the street. He turned and pelted for the stairs, taking them two and three at a time; four above a landing. He’d done this before and knew the tight spots. ‘Watch out Barnicoat!’ squawked the man from 405, dodging. KaPOK! Garney Barnicoat exploded from the ugly, grey apartment building where he lived, into a cold, grey, rainy morning. Late again! In the far distance three people were stepping up into the bus. ‘Wait!’he yelled. No one heard him above the sound of traffic. He sprinted for it; his schoolbag swinging wildly. The queue became two people. ‘Wait!’he called again, but the last person was looking forward, stepping up, and didn’t see him. ‘Am I invisible this morning?’ he fumed. ‘Waaaiit!’He swung his schoolbag high to attract attention, but it over-swung and landed on his foot like a lead soaked football. Books and sandwiches were booted out of the bag and into a long pool of water. He tripped and dived in after them. The wave sloshed out, then back, sending freezing water along his leg and into his underpants. He looked up. The bus was still there! Maybe the bus driver was waiting! He frantically stuffed the soggy books and sandwiches back into the unholy mess that was his schoolbag and ran for the door … as it closed. Had the bus driver been watching he would have seen a boy, muddied and wringing wet, nose pressed against the glass, pawing forlornly, with bits of grass and twigs sticking to him, looking like a soggy lamington waving a ticket, yelling:‘S-T-O-P!’ But the bus driver was watching the traffic as he revved up, which drowned the sound. The bus drove away. Garney stared as the bus dwindled into the distance. Silence rained down with the all swallowing drizzle. Water trickled in through the holes in his shoes. A long sigh of resignation misted in the morning chill. Marrott will be onto me again, he thought. His shoulders slumped. Despite this, even a short swim on the sidewalk couldn’t long drain the happiness from Garney on this day, for on this day he was to come into his Twelfth. ‘In the Barnicoat family, this means inheritance, boy!’ his Uncle Horvest had impressed on him many times. ‘It means the House of Two Rooms! It means you’ll come into your Coat!’ Uncle Horvest often spoke with exclamation marks. How one could ‘come into a coat’ Garney had no idea. He had asked, but Uncle Horvest clammed up - only ‘Twelvers’ and over were allowed to visit or even talk about it. There was something secret about Two Rooms. He knew only that it was ‘away’ in the country. In his mind Two Rooms was a cosy cottage; a place of warm fires and long stories told around the hearth. Being ‘away’, getting there wasn’t easy. Fortunately, Aunt May was taking him there for the holidays - starting that afternoon. To Garney it felt like the night before Christmas. It felt like standing on the edge of a cliff. And, soon enough, his walk became a bounce as he forged his way to school. It lasted almost till he reached the school gate. At zero minus four minutes Mr Marrott was having a good day. He marched up the corridor to his classroom, scolding two students for slouching, one for shuffling as he walked, and two for ‘looking suspicious’. He was feeling particularly good because today was ‘come-uppance’ day. It was Grades’ Day and the best students (especially those who Mr Marrott thought met the grade) got good marks, while those that lived outside the square (especially one child) got bad marks. By‘outside the square’, Mr Marrott meant those - those children - who spent time in the world of dreaming. He never dreamed. Certainly he could never remember any - and would never ever admit it to anyone else. Mr Marrott lived in the perfect concrete world of action and consequence. ever met. It was as if that student had come from dream-land! And that student was about to get his come-uppance. certain student slipped in quietly behind Mr Marrott, one minute and five seconds later. Fortunately for Garney, Mr Marrott did not notice because he was organising report cards into order. This done, at zero minus two minutes, Mr Marrott strolled along the aisles of the classroom, handing out cards to the students as he passed. ‘Forsythe, straight A’s,’ he chortled, ‘Well done Forsythe.’ Forsythe was a good ‘book man’. Mr Marrott smiled - well, his mouth smiled, but the rest of his face was unmoved. boot. He towered over Garney from what seemed a great height, his grades hand held high. not more than two pages, in Garney’s mind it landed with a thud-ud-ud. A cold, dead thing. ‘Phwaw!’said the class. The blood drained from Garney’s face. ‘Through B to C - Satisfactory and D - Not Yet. True Huddersby? Huddersby scowled again as expected. nightmare. ‘Ha, ha, ha...’ on and on; an ugly, clawing madness. He pressed his eyelids together and stuck his fingers in his ears, trying to shut it out - wishing in his crying heart that it would all please stop. thing that he might reach out and break into powder. He reached for it and with the first touch the ‘Ha...Ha...Ha...’ ground to a halt, as if time itself was rusting up. All utterances, laughter and hubbub stopped like someone had shut the door on a tomb. He hit the bottom of the well, abruptly aware that he was still in class, and that something very odd was happening. The silence was so all pervading that Garney’s hammering heart was like a tom-tom. He opened his eyes and unplugged his ears. Everyone was still there, frozen mid-laugh: glaring, leering puppets. Mr Marrott was bent forward in a frozen donkey’s bray of a laugh, right next to Garney’s ear. Garney pulled away. dared him to comment. But then she turned and caught his look. As if breaking the spell with her ordinariness, the classroom exploded into laughter behind him, until a silence of a more ordinary kind descended - the silence of complete amazement. Garney Barnicoat was gone. Rare. That’s what they called him. It had been nearly six months since Garney had lost his father, and they rode him hard about it. Hiding in the toilets for the rest of the day, his memories returned to haunt him. ‘How many kids lose a parent?’ Huddersby had taunted. The other children counted. never understand it. He did not fit here. He was always late. He was always out of step. at his feet and left him with no shield against harsh reality. Later, Garney peered out of the stairwell window and scanned the schoolyard below. No Thatch. Children pushed and shoved, eager to find their buses. After a full minute he was sure. No Thatch. ‘Barnicoat!’said a voice in his ear. Thatch Huddersby and three of his gang. Icy chills traced the rain that trickled down his back. ‘Where have you been, hey?’ Thatch was big and ham-fisted and mean and was gunning for Garney. ‘I … ‘ said Garney looking around desperately. No one came to his aid. ‘So our gang’s not good enough for ya, hey?’ said Huddersby, giving Garney a grand push. Garney had avoided Huddersby’s gang exactly because they were big and ham-fisted and mean. always, dressed in a black dress and a baggy-sack shiny silk hat. ‘…real soon.’Huddersby’s gang slunk away. Garney shrank inside. ‘I’m home Mum!’ he called as he entered the flat. The light of a bare bulb illuminated brown and grey furniture and peeling yellowing wallpaper. He found her in the bathroom/toilet/laundry - closing his suitcase. ‘Fine thanks,’ he said. He didn’t mention his grades ... or the strange incident in Mr Marrott’s class... or Thatch Huddersby’s intention to turn him into a human punching bag. His mother had enough to worry about. ‘I packed your case for you, since you somehow forgot to do it earlier.’ Garney had gone to pack his case twice that morning, but as usual it never happened. He just seemed to get distracted as he went to do things. ‘You’d best head off if you are to arrive before sunset.’ She kissed his forehead. A worried look touched every corner of her face. Since his father was gone, this was the only look he ever saw. She smiled a faded reflection of a smile. She had been like that ever since Garney’s dad was gone. These days she just seemed to shuffle through the day. Beforehe was gone, she was always bright and chirpy. But since then she took in other people’s ironing to make money. He knew he was one of the people that other people called poor. Aunt May had offered to help, Uncle Horvest and Auntie Joylene had offered too, but Crystal said no. Garney sometimes wondered if it was not the loss of his father, but Garney himself that made her worry so. Maybe his scatter-brained ways had tired her out. In the refuge of Aunt May’s car, the city gave way to country. The falling rain, the mist over the passing fields, the shadow world of the farmhouses that loomed and then were lost in the dreary light; all echoed the feelings in Garney’s heart. Having not returned to class, he would have more explaining to do after the holidays; another weight on his conscience. Garney cringed, and Aunt May caught the look. Garney nearly choked. To hear Aunt May talk of such things as - well powers - was kind of spooky. Until that moment Aunt May had been the pillar upon which logic rested. If she believed in powers ...? Of course, she was right. From the normalcy of the car Garney put his episode in class down to stress and imagination. He had imagined the whole thing. Aunt May turned down a narrow lane. The scruffy hedges gave way to rows of stately trees, with amber and green leaves that met high over the top of the car, creating a kind of living tunnel. The tunnel brightened as the sun came out and sparkled in the raindrops that clung to the leaves like a billion rainbow coloured jewels. The trees seemed to bow to him as they passed and shook themselves free of the rain. Maybe a breeze from the car made the leaves flutter. Garney didn’t know. Behind the line of trees a hedge grew, red and yellow, too high to see over. He wondered whose place this was and who did the gardening. Perhaps a neighbour. Whoever it was must love the living things that grew there. A tiny cottage came into view, almost inside the hedge. It looked cheery enough and Garney thought,‘Well, this is it then,’ but Aunt May drove straight on. Garney opened his mouth to ask how far they had to go, but the lane ended and the sun shone brightly on his inheritance. He left his mouth firmly open. A huge house stood before him, grand yet warm and inviting. Its walls were of amber sandstone -each stone was keyed to fit the one next to it, though no two stones were exactly alike in size. One half of the wall was covered in ivy that grew neatly around the windows. A great door it had, and generous windows high up and low down. as he took it, making both of them jump. the key’s tail into its hole. arched doorway next to a tapestry of the Barni-Coat of Arms - a shield with a man wearing a flowing robe and holding a staff. Prickles of anticipation danced on his scalp. The door’s sandstone arch swept overhead as he mounted two steps onto a granite landing. At his right hand, a stairwell of stone and heavy wooden stairs spiralled up dimly, calling him to an unknown world. Garney was tempted to follow but, glimpsing the next room, he was drawn forward by his astonishment. He practically fell down the two stairs on the other side for his eyes told him that the next room wasn’t. Rather, it was a forest. Slowly the space resolved into a vast painting where everything, even the furniture, looked like a forest. Its trees stretched back as far as the eye could see. He ventured into its eerie quiet, then clapped his hands to break the spell of silence. The noise fell dead, lost in the trees that were not there. ‘Who’s that?’ asked a disembodied voice. Garney whirled around; his eyes darted this way and that. Finally a shape shifted in a chair that Garney had mistaken for a bush, revealing a boy wearing a cloak so drab, so utterly boring, it all but disappeared into the background. In the boy’s hand was a walking stick. ‘Eldeth!’ said Garney with surprise and delight, ‘What are you doing here? Where did you get that awful coat?’ Eldeth laughed and held out the grandest walking stick Garney had ever seen - it was covered in carved stories. Garney pulled on it, dragging Eldeth out of the chair and into a standing position. He hardly noticed Eldeth’s crooked spine and stunted legs anymore. ‘Three days ago!’ said Garney slapping his forehead. ‘Yes, exactly! And as for myBarni-coat - observe.’ He pulled it off and threw it away. Garney went cross-eyed trying to follow the drab thing against a background of trees.‘Fetch,’ said Eldeth, grinning. Garney went over to it and reached down. What he thought was the coat was just a pattern on the floor. ‘Exactly,’ said Eldeth, and lifted it off the floor several paces away. ‘What are you doing?’ said Garney. Garney clammed up, squinted, and peered out through his eyelashes and waited. Nothing. moving all over the place, but not once could he properly catch them at it. He tried to open his eyes wider to get a better look, but as soon as he did, the animal either disappeared or turned into a normal part of the painting. ‘I’ve been trying to catch the animals out,’ said Eldeth, ‘but after a while with all that squinting, you get tired, fall asleep and have weird dreams. And,’ he said, ‘the whole place is exactly nothing like it seems. Come. Look! Watch out for the dragon,’ he said, then without explanation, went to the spiral stairway and with a flick of his coat, disappeared into the dim. Dragon? Garney blanched. Considering how real the forest room was, he wasn’t sure that he wanted to see any dragon, though his legs leapt after Eldeth, drawn by the magic of the place and a fear of being left behind. ‘Don’t you love it!’ said Eldeth, ‘I knew you would. I’ve always thought that you would be good at dragons.’ What he meant by this, Garney couldn’t guess. ‘I’m in the room down the hall with the Lion-Thing on the door.’ Garney thought Eldeth had said ‘Lion King’ and so made no comment. Inside, Garney found a bedroom fit for a king. Dragons carved into the walls seemed certain to fly away at any moment, or to leap into the room and fill it with their majesty. After living in the tiny flat, he had forgotten that places could be so grand. He yelled ‘I love it!’ and flung himself onto the bed. Garney gulped. It was dinner time, but it was not the food that made him gulp. Rather, the blurred out water-washed colour of sea creatures rippled underneath the marble dining room floor. At least, he guessed it was marble, if very confused marble, and, at least, he guessed they were sea creatures. or at least were quite pointedly not noticing. He, Eldeth, Uncle Horvest, Auntie J and Aunt May inhabited only one end of the vast oak table that ran along the length of the dining room, edged with king’s chairs carved with the Barni-Coat of Arms. Sporting a handlebar moustache on a red face, waistcoat and big fat tie on a big fat belly, Uncle Horvest stood out like a pumpkin at a party. ‘Glad to see you could make it old chum. Capital, capital.’ He pulled out a pair of large cigars and offered them to the boys, ‘For after dinner…’ he said by way of explanation when they refused, ‘…by way of celebration.’ He looked a bit put out, so, not wanting to offend, the boys took the cigars and put them in their pockets. They would never be smoked. Garney had puffed on one once and could feel the green flush through him just with the thought of it now. It seemed to him that having one after dinner would be some form of rare torture. He would just have to find somewhere to hide it. ‘I take it Eldeth has shown you around?’ Uncle Horvest twirled the end of his moustache. asking of the question seemed sufficient in itself - to Uncle Horvest at least. ‘This is a special day for you!’ said Aunt Joylene excitedly, pinching Garney’s cheek a little too firmly. Garney kept smiling, though he gritted his teeth and his eyes began to water. She rummaged in her handbag, ‘I’ll run and check the desserts. I wouldn’t want to mess up the mango mousse, but these should tide you over till I get back,’ Garney knew what they would be before the hand came above the edge of the bag. It was a handful of sweets. Auntie J always had sweets in that bag. It was as if they were a self-replenishing supply. turned and heaved to the kitchen, her buns reminding Garney less of buttocks and more of a pair of koalas fighting in a hessian bag. Garney sometimes wondered at the vastness of his Aunt and Uncle, given that Eldeth, their son, was so thin. blue sea. Seemed to duck and swoop, Garney corrected, though it was hard for him to be sure the movement was not real. head. Why this was, he couldn’t imagine. There were other animals, not as large yet no less magnificent. There were lion-things with golden, cat-like eyes. Garney was sure they were moving (‘capering’ might have been more accurate, for the movement was quite quick), though he could never quite catch them at it. Upon the dome above him, as if at mid-morning, the sun shone. Seeing as it was the middle of the night, he asked Uncle Horvest about it. Horvest was all‘poppycock’ and ‘fiddlesticks’ about it. Garney lifted his feet off the floor - the sensation of wetness from it too strong to ignore. He looked down for the hundredth time. Aunt May overheard. ‘Take care in Two Rooms,’ she cautioned, ‘Things are rarely as they seem.’ Family history hinted of secrets, she said, and treasures, she said, both now well hidden. The Barnicoats had once been numerous, she told them, but time had taken its toll and few now remained. The stories had been lost. Now only the house remained - and Garney of course, and Eldeth, and precious few others. The emptiness of the rest of the table called witness to this fact.